You want to eat salad more often, but there’s so much washing and chopping involved. It just takes too long to prepare! Plus, when you’re hungry, and the kids are running around, the last thing you want to do is start cutting up a bunch of veggies. The best solution we have found is to set aside some time to make a large salad at the beginning of the week. Don’t put any dressing on it (that will make it wilt after a a few hours). 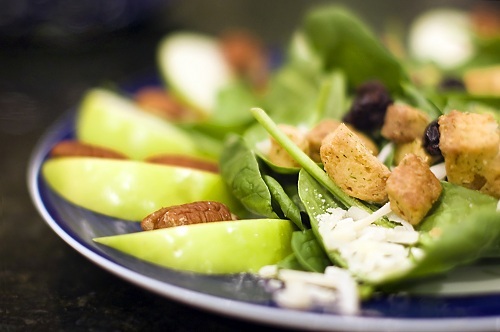 Eat a little of the salad each day, adding dressing or extra ingredients to each serving, as needed. 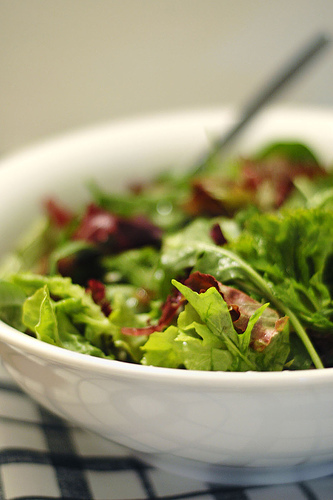 To help keep the salad fresh, place a paper towel into the bowl before covering. This will absorb extra moisture. Once the salad is finished, make a new one. Just make it a habit to have a salad in the fridge at all times (or close to it). Depending on the number of people eating the salad, you may only need to make one or two a week. This is a perfect example of how the answers to our healthy eating dilemmas are often nothing more than a little planning and preparation. If you’d like to eat salad more often, I’d love for you to give this a try! Do you like to eat salad? If so, how do you make it a regular part of your diet?